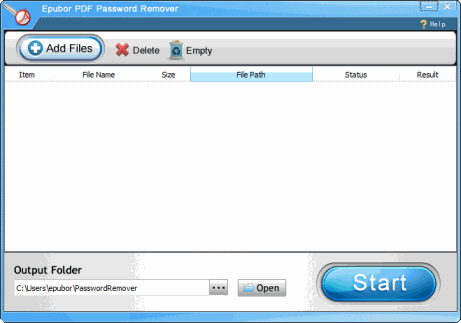 PDF Password Remover, remove PDF password and restrictions with user password or owner password. No quality loss on original files. Epubor PDF Password Remover is a light-weight and easy-to-use PDF cracker to help users unlock password protected PDF and remove restrictions on printing, editing and copying directly. 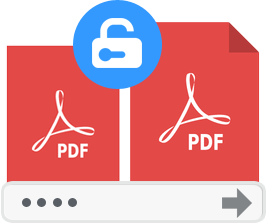 To remove password protected PDF files, users need to enter the user password (opening password) or owner password to unlock PDF files. 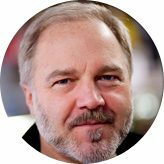 Epubor PDF Password Remover doesn't require users to have any computer skills. 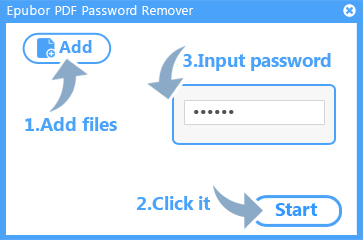 Users can remove the password from their PDF files with only 3 easy steps. 1. Drag PDF files into the program, or you can also click "Add Files" for file importing. 3. Input the user password (opening password) or owner password. Supported encryption level: Acrobat 6.0 and later, Acrobat 7.0 and later, Acrobat X and later. Supported encryption strength: 128-bit RC4, 128-bit AES, 256-bit AES. Supported encryption type: Password protection only. Certificate protection removal is not supported. By removing the password of PDF files, people can read the PDF files without entering correct password when they open the PDFs. And the restrictions like edit, print, copy will also be removed. 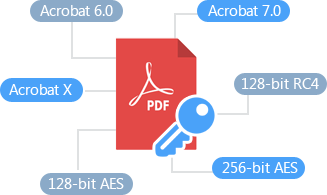 The protection removal process won't hurt the original file's quality at all, you can use this program to unlock your PDF at ease, every byte and digit in the PDF files will stay safe and sound. 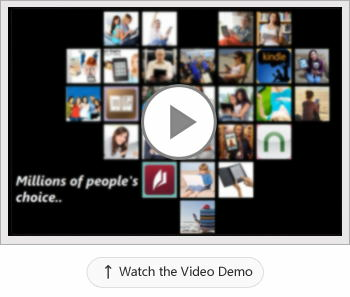 A comprehensive user manual is provided even when the program is easy to use. The specific user manual is included in the software. 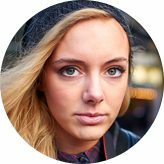 If you encounter a problem whilst using our software, an instant troubleshooting guide will pop up to help you find a solution. 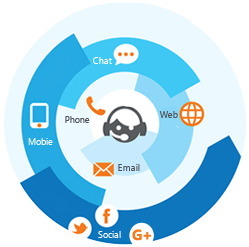 Our customer service is online 12*6, and is totally free for technical support. "After pdf key removed, so free to print them. Thank you guys! " "Beautiful design, easy to use. Hope it would be better. " 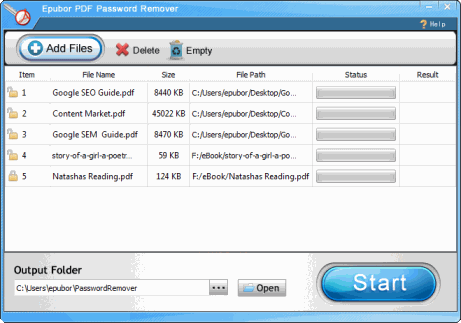 PDF Password Remover has a fresh and simple user interface. 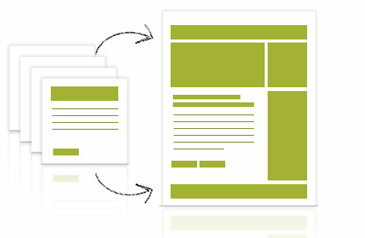 It's an easy for users to grasp the core features quickly. Just requires user password or owner password to start remove restrictions from pdf files without quality loss. Just click 'Start' button and finish the process of removing PDF password. Navigate to the out folder by clicking the 'Open' file icon. 1) It's a freeware now, users can use this software without any limitation. 2) No password required for PDF only protected by owner password. 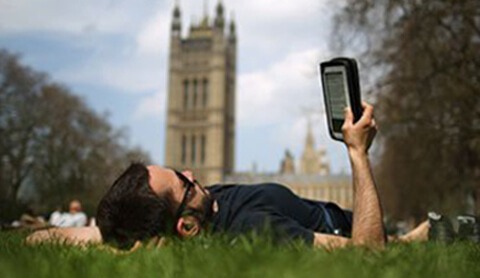 Epubor helps you convert, transfer, edit and read books anywhere on any devices, include the best eBook Converter and Transfer functions.